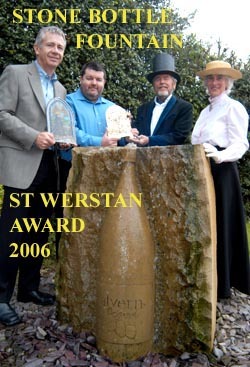 The St Werstan Award recognises the enhancement of the Water Heritage of the Malvern Hills. 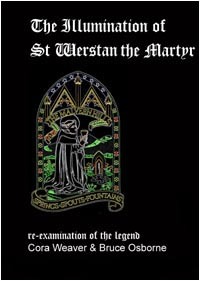 St Werstan was one of the earliest saints to be associated with Malvern. As patron saint of Malvern Springs and Wells, it is fitting that his name is linked with this scheme to encourage the enhancement of Malvern's water heritage. The Award is for the conservation and renovation of our springs and wells and their immediate environment. The scheme is run by Friends in conjunction with Coca-Cola. Friends, local residents and visitors can nominate sites for an award by forwarding a short resume of the circumstances and location. Nominated sites are then featured in a short critique in the Friends Newsletter. Friends of Malvern Springs and Wells are then invited to express their views as to whether nominations justify the award by completing a simple appraisal enclosed with the relevant newsletter. The appraisal is based on six factors, preservation, environment enhancement, public accessibility, provenance, maintenance and general WOW factor. Those sites receiving the St Werstan Award for Enhancement of Water Heritage receive the St Werstan plaque and stained glass window for public display. 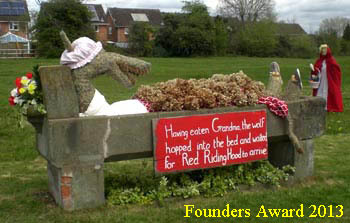 Founders Award for well decorating. Modern day well decorating was founded in 1993 by Local Historian Cora Weaver. Since 1993 it has been delightful to see the rapid growth, beauty, and interest in the well decorating over the last 20 years. The award is a heavy, cast brass plaque and depicts St Werstan, founder of Malvern's first priory in the mid-eleventh century and patron saint of Malvern's springs and wells. He is seen kneeling on the Malvern Hills with a fountain in the background and is surrounded by architectural details from the present Priory Church, flowers of the earth and stars of the firmament. On the 6/7 May once again Malvern celebrated its glorious and unique collection of springs and wells with Well Decorating. Over four dozen sites were displaying their décor to the theme of 'Year of the Woman'. The weekend event culminated in Founder's Prize giving in Priory Park. The Founder's Prize for well-decorating this year was won by Poolbrook's St Andrew's Church for their interpretation centred on the churchyard pump. Here the theme, Year of the Woman, was portrayed by a traditional Middle-Eastern, Biblical tableau of a woman drawing water from a well. 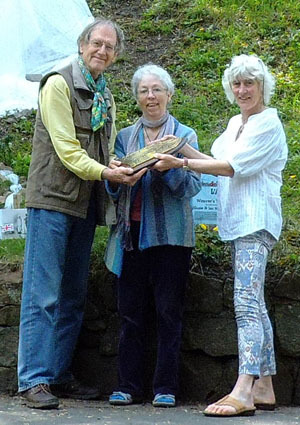 Well-decorators Iris and Peter Senior receive the Founders Prize from Cora Weaver. The now famous Malvern Well Decorating took place over the May Day bank holiday weekend. The theme was the 'Tree of Life'. This year we were abroad on the Malverns Worldwide project and had to suspend the presentation of the Founders Prize. Friends reported however that one of the most stunning of the many sites decorated was the Lower Wyche Spout. 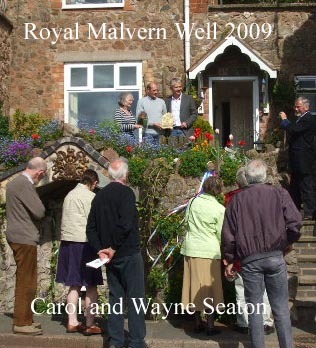 At the Well Decorating over the May Day weekend the prestigious Founder's Award for well-decorating has this year was presented to Susan and Ian Woodcock for their decoration of Weaver's Well in Malvern Wells. The theme this year was "Friendship", with a particular emphasis on the formal twinning on 30th April between Malvern and Bagneres de Bigorre, the French spa town at the foot of the Pyrenees. To find inspiration, Ian and Susan spent a week at the French spa with its stunning backdrop of the snowy Pyrenees. On their return, the couple recreated the essence of Bagneres de Bigorre on the slopes of the Malvern Hills. Their reconstruction included the baths, cyclists representing the Tour de France, which passes through the town; walkers, bathers and sunbathers. On the hillside behind Weaver's Well, the white, peaked Pyrenees were recreated complete with skiers and, linking the town and mountains, would you believe, a cable car! 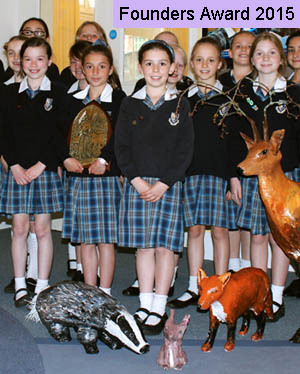 This year the Founders prize was presented to Year 5, Malvern St James School girls for their creative decoration of Westminster Bank, This year's theme was The River of Life, and the Year 5 girls' decorations included a variety of animals that rely on water for their survival, all done with minimal assistance from their class teacher, Mrs Sarah Jones. At Westminster Bank the river was supporting life in all its variety - flying, crawling, slithering, swimming, hoofed and unhoofed, hairy and hairless, and flora. Materials used included natural and handmade items made with papier mache, clay and card, tree, grass and flowers. The deer was prominent from quite a distance; an enticing landmark that beckoned visitors. The use of the deer turned back the clocks centuries, to the time when animals were hunted for sport in Malvern Chase. 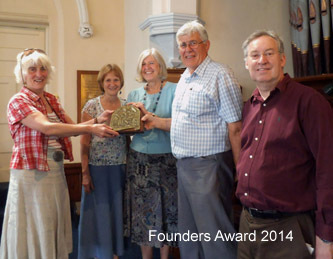 The winner of the 2014 Founder's award was the Holy Trinity well-decorating team. For the fourth successive year they turned Back Lane (Rose Gully) Spouts into an eye-catching, early May spectacle. The theme this year was 'Peace' and Cora, who founded Malvern's modern well-decorating event in 1993, was struck by the contrast between the chaos and dismal colours of the war aspect of the design, and the uplifting white and rainbow colours of peace. In the picture Cora is presenting the award to the Holy Trinity team comprising left to right: Catherine Stevenson, Jane Banwell, Nigel Banwell and Allister Stevenson. Founders Award 2013 The theme for the 2013 Malvern Well Decorating was "Once upon a Time". Red Riding Hood was part of Team Trough's bewitching nursery rhyme interpretation at Barnard's Green Fountain for this May event. It caught the eye and imagination of event judge Cora Weaver and so in 2013, on behalf of Friends of Malvern Springs and Wells, Cora presented the Founder's Award for Well Decorating to Team Trough which was received by local residents Della Cole with baby Isaac, Ted Higham, Molly Waldron, Richard Bosley, Joan Young, Jackie Higham, Jasmine Cole and Stephanie Underwood-Webb. The Founder's Award for well-decorating 2012 was presented to St Matthias School, Malvern Link for their decoration of Lord Sandys' Spout - judging the contest, Cora was impressed with many aspects of the decorated well, particularly the interpretation of the theme 'Achievement'. St Matthias pupils interpreted the theme as on-going achievement - achievement of the present and the future. The overall effect was lively and cheerful - the decoration was eye-catching, relevant and absorbing. This was the first time that the Founder's Award has been presented. It's an achievement for the school, complementing this year's theme. The award is sponsored by Coca-Cola Enterprises as part of the St Werstan Award scheme for the enhancement of Malvern's Springs and Wells. The scheme is managed by the Friends of Malvern Springs and Wells. 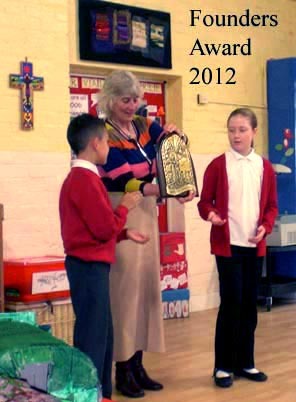 In the picture Cora presents the Founder's Award to Phoebe Collins of Year 5 and Dominic Crutchley of Year 4. 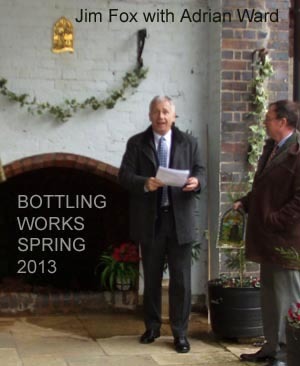 6th Award In February 2013 Bottling Works Spring was bestowed with the St Werstan Award. This was the 6th site to be awarded the famous brass plaque. As a result of the ballot of Friends we can reveal the following scores. For preservation, the fountain scored 90%. For environment enhancement the score was 84%; public accessibility scored similarly at 84%; provenance 88%; care and maintenance 86% and the general wow factor score was 88%. Overall the score was 87%. The award ceremony was attended by the Chairman of Malvern Hills District Council together with Friends and other dignitaries. In the picture Jim Fox, Head of Corporate Affairs at Coca-Cola unveils the plaque which was presented to Adrian Ward the proprietor of The Courtyard on Belle Vue Terrace, Malvern, where the much enhanced spring is situated. 5th Award In 2011 Hospital Fountain received the 5th St Werstan Award with an overall score on 77.5% in the Friends ballot. The Hospital Drinking Fountain started life in the entrance lobby at Malvern Community Hospital, Lansdowne Crescent and dates from the time the former hospital was built. The original plaque above the fountain recorded the opening of the hospital on 29 May 1911. 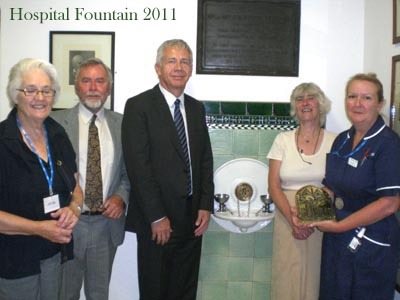 In February 2011 the historic drinking fountain was restored and relocated in the new Malvern Community Hospital, Worcester Road, Malvern Link alongside other heritage artefacts from the earlier building. Following the ballot of Friends, the results were as follows: Preservation 67% Environment Enhancement 87% Public Accessibility 52% Provenance 80% Maintenance 92% General WOW Factor 77%. The date of Award Presentation was Friday 12 Aug. 2011 and was carried out by Jim Fox of Coca Cola. In the picture Jim Fox presents the award to Sian Edwards of the Malvern Community Hospital, with Sheila Young who attended on behalf of the Hospital Friends and Cora Weaver & Bruce Osborne of Friends of Malvern Springs and Wells. 4th Award The fourth location to receive the award was the Royal Malvern Well which was transformed from a rather dull roadside spout with an intermittent flow of water that was temptingly inaccessible, to a charming and welcoming water feature. This has been done with the assistance of Heritage Lottery Funding and the enthusiasm of the owners. Most notably its Malvern stone walls have been repaired, an appropriate coat of arms mounted on the arch, and access to the water spout has been opened up. The owners, Carol, and Wayne Seaton, restored the water supply thereby making it once again one of Malvern�s many springs and spouts now in water. 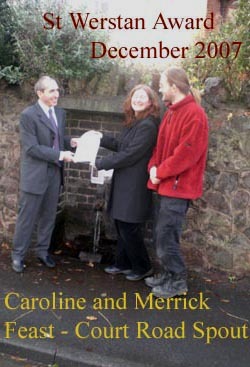 Following the ballot of Friends of Malvern Springs and Wells, it was apparent that The Royal Malvern Well should receive the St Werstan Award. The result was a 95% overall score which is well above the theoretical mean. Results by category were Preservation: 92%, Environment: 90%, Public Accessibility: 97%, Provenance: 100%, Maintenance: 97%, General WOW Factor: 90%. Carol and Wayne deservedly received the solid brass St Werstan plaque from Jim Fox, Senior Corporate Affairs Manager at Coca Cola Enterprises in May 2009. 3rd Award The third nomination to receive the award is Court Road Spout During December 2007 Caroline and Merrick Feast received their award for restoring the water flow to Court Road Spout at Barnards Green. The award was made as a result of the ballot run through the Friends Newsletter. The result was a 78% overall score which was well above the theoretical mean. By category the nomination scored: Preservation - 75% Environment Enhancement - 73% Public Accessibility - 82% Provenance - 77% Maintenance - 85% WOW Factor - 75%. 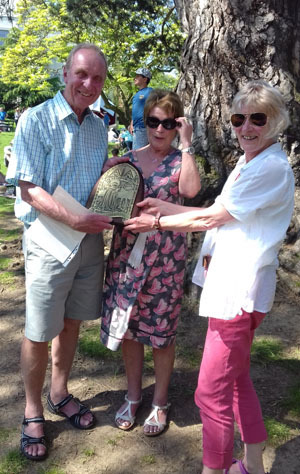 The award, which comprises a large brass plaque, was presented by Rob Stilliard, from the Malvern Water Bottling Works at Colwall. It was particularly in recognition of the ingenuity with which the water was reinstated. This involved the construction of a special debris drilling device, made by Peter Feast, Merrick�s father. 2nd Award Our second nomination to receive the Award is Stone Bottle Fountain at Colwall, to celebrate water bottling in the Malvern Hills. The historic works at Colwall dates from 1892 and employs about two dozen local people. The fountain was inaugurated on 13 August 2004 to a design by Bob Powell and sculptured by Darren Bennett, stonemason of Worcester. Following appraisal by Friends of Malvern Springs and Wells, Stone Bottle Fountain has an indexed response score that justifies it receiving the award. Based on Friends responses, the indexed results by category are as follows: Preservation = 86; Environment = 74; Public Accessibility = 83; Provenance = 91; Maintenance = 84; Wow Factor = 87; OVERALL = 84. This compares favourably with the mean of 60 arrived at by theoretical sampling. Gary O'Neill, Site Manager of Colwall Malvern Water bottling works received their award in April 2006. 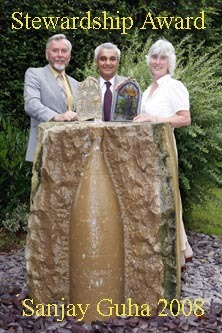 Primeswell Stewardship - We were honoured on July 2008 when Sanjay Guha, President, Coca-Cola Great Britain & Ireland visited the Malvern Hills and the bottling works at Colwall to receive a St Werstan Window in recognition of their stewardship of Malvern�s most famous water. It was in 1927 that production was switched to the Primeswell source near British Camp and this led to the era of modern day bottling. In the 1980s the bottled water industry was revolutionised with the upsurge in demand. Production and marketing became highly sophisticated. In spite of tighter regulation and the demands of modern day marketing placed on water bottlers, the bottling works at Colwall has survived. There can be no doubt that this is due to the astuteness and support of Coca-Cola Great Britain who own the site and bottling partners Coca-Cola Enterprises who manage and maintain the site. Here we have a charming local enterprise, employing about two dozen local people. It promotes Malvern world wide and establishes an awareness that benefits the local economy in many ways. Footnote: since the above was written the bottling plant at Colwall has closed. In October 2010 the last bottles of Malvern Water came off the production line ending 160 years of Schweppes bottling Malvern Waters. The plaque awarded is now in the custody of Malvern Museum together with other artefacts from the site. 1st Award Friends first nomination to receive the Awardwas the former public toilets Penny Cottage and Osborne's Fountain, on the Worcester Road in Malvern Link. This was a favoured alternative to complete demolition of the site, thereby avoiding the possible destruction of Osbornes Fountain. Following appraisal by Friends of Malvern Springs and Wells, Penny Cottage had an indexed response score by category as follows: Preservation = 60; Environment = 82; Public Accessibility = 55; Provenance = 80; Maintenance = 75; Wow Factor = 95; OVERALL = 74. This compared favourably with the mean of 60 arrived at by theoretical sampling. 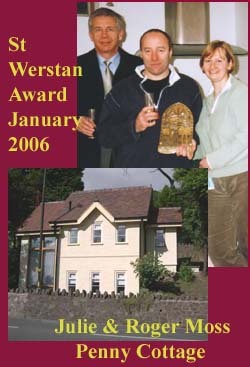 Julie and Roger Moss, who converted Penny Cottage to a charming residence received their award in January 2006. Back numbers of Newsletters with more detail of how the awards work are available to Friends on request without charge if a SAE is enclosed. St Werstan or Werstern was a monk who relocated to Malvern from the monastery at Deerhurst in the time of Edward the Confessor. Encouraged by the presence of pure spring water, Werstan chose a rocky ledge in the vicinity of the present day St Ann's Well to found his hermitage. The spring may well have been named after him, St Werstan's Well, with St Ann's Well a much later designation. Here Werstan hoped to live a holy and solitary life as a recluse but was murdered and subsequently honoured as a martyr saint. The hermitage was established here before the Norman Conquest and was eventually to lead to the creation of a full scale priory. Aldwyn, who had been made a monk at the Cathedral Priory of Worcester by the Bishop, and a companion called Guy, replaced Werstan after his murder. Aldwyn, on the Bishop's advice, gave up his contemplated pilgrimage to Jerusalem to continue the religious order at Malvern. Thus Malvern was founded. Werstan's hermitage was reputed to have survived into the 19th century. Also human bones have been found on the site. Relics of St Werstan were on view in Malvern Priory in the 15th century. This uniquely Malvern saint, the founder of Malvern, now enjoys further recognition through the posthumous endorsement of the new award scheme for enhancing our water heritage.